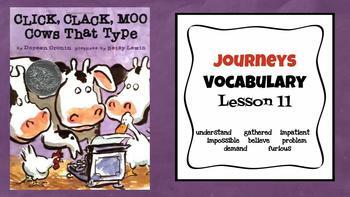 Each slide corresponds to a vocabulary word for Lessons 11-15 in the Journeys 2017 version. This product includes 40 vocabulary words each with its definition, word in a sentence, think and talk about it, and a picture. 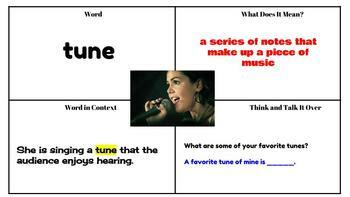 Project the slides to introduce the words in the lesson or as a reinforcer. Also included are opportunities to think, collaborate, pair share, and speak using sentence frames. 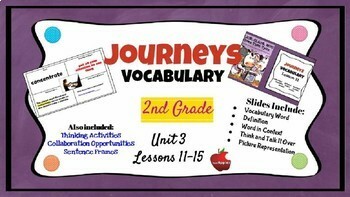 Also, available are Journeys Vocabulary Powerpoints for other units. 5 and 6 are upcoming.